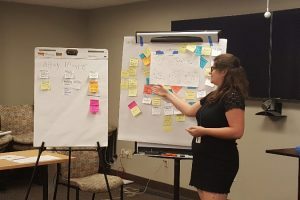 ICAAD was invited to North Carolina to conduct a workshop for senior and country staff at IntraHealth International on our systems approach to identifying and disrupting systemic problems like gender-based violence and gaps in maternal health services. IntraHealth International is a global health organization focusing on health workers and their role in improving the health of women and their families, with over 500 employees working in 37 countries in Africa, the Americas, and Asia. 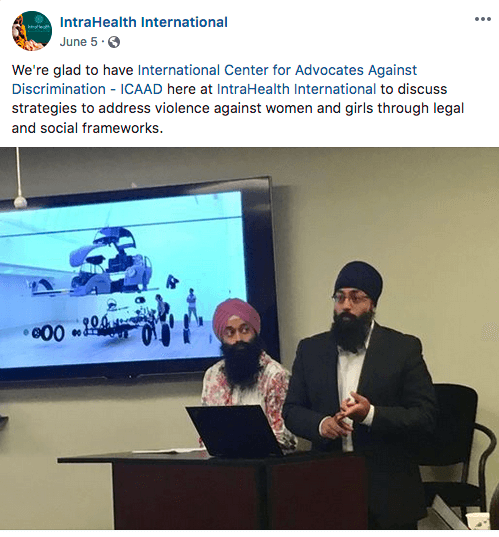 The sessions focused on approaches ICAAD used for its maternal health project in India, and medico-legal training and judicial reform work in Pacific Island Countries to combat violence against women and girls. ICAAD Co-Founders Hansdeep and Jaspreet followed their presentation by conducting participatory design exercises with IntraHealth staff, delving further into how approaches can be iterated and become sustainable. By sharing insights on how to link justice and health sector advocacy, ICAAD aims to foster greater collaboration with IntraHealth in the future. Special thanks to Constance Newman, Nola Paterni, and Rebecca Kohler for the invitation. ICAAD previously presented at SwitchPoint in 2016, on barriers to access to justice for women in the Pacific Islands, and improving accountability. Read more about that presentation here. We’re excited to be partnering with Be Social Change at this year’s New York Nonprofit Connector on July 25, 2018 at 6:30 PM. 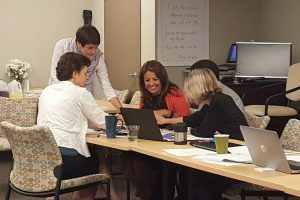 Join us for a facilitated networking event to strengthen New York’s nonprofit sector by creating meaningful connections, building new partnerships, and sharing ideas and resources! You can register here: https://www.besocialchange.com/new-york-nonprofit-connector/. For a 25% discount, use the promotional code nynpc25 at checkout.